Tests show the majority of people say “A bat” or “A butterfly”. I see a fox face. Supposedly, there is no wrong answer. 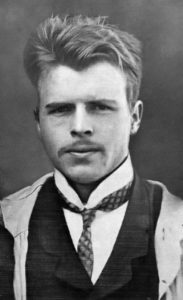 April 2 marks the passing of Hermann Rorschach. Rorschach was a Swiss psychiatrist and psychoanalyst who used this inkblot along with nine others for the Rorschach Test. He showed patients these images and asked what they thought the images looked like. Their answers gave insight into the workings of the patient’s thought processes. 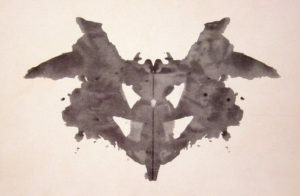 While the test is still popular, controversy exists among psychologists as to whether or not the test actually shows anything at all. 1995 – Hannes Alfvén died. 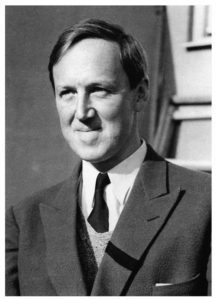 Alfvén was a Swedish physicist who was awarded half the 1970 Nobel Prize in Physics for his theory of magnetohydrodynamics of plasma. He outlined many theories to describe the behavior of aurorae, the Van Allen radiation belts, and interactions of solar flares on Earth’s magnetic field. He described the wave plasma ions form when affected by a magnetic field known today as Alfvén waves. 1931 – Jacques Francis Albert Pierre Miller was born. Miller is a French immunologist who discovered the function of the thymus. He also identified mammalian T and B lymphocytes along with their function. T-cells are lymphocytes which are important to cell-mediated immunity. They have chemically active receptor sites on their surface which detect infections and signal a response to the immune system. B-cells are a type of white blood cell which releases antigens in response to specific infections. 1928 – Theodore William Richards died. Richards was an American chemist who gave the first chemical evidence of the existence of isotopes. An element is determined by the number of protons in its nucleus. Isotopes of elements are determined by the number of neutrons with the protons in the nucleus. If an element has multiple isotopes, the element will have multiple atomic mass values. The atomic masses written on the periodic table are weighted averages of all the different isotopes of each element. Richards spent an entire career systematically obtaining pure samples of elements and carefully determining each element’s atomic weight. From 1889 to 1932, he had obtained atomic weights for 55 different elements. 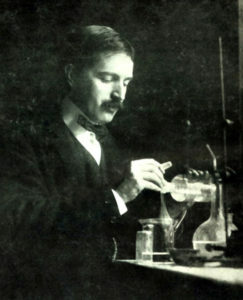 His technique was so precise that he noticed an element’s atomic weight could vary by small amounts from sample to sample. He could not explain why different samples would have different masses. He would not have an explanation until 1913 when J.J. Thomson first identified two different isotopes of neon. Richards would receive the 1914 Nobel Prize in Chemistry for his work and contributions to atomic structures. His work would be quickly surpassed by British chemist Francis Aston, who invented the mass spectrometer. This device would quickly and easily perform many of the same tasks Richards painstakingly spent his life trying to accomplish. 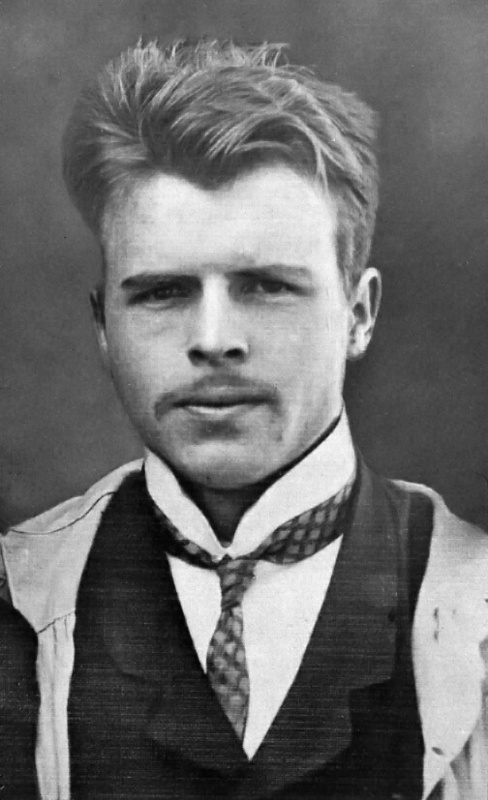 1922 – Hermann Rorschach died. 1845 – The first photograph was taken of the Sun. First photo daguerreotype of the Sun. 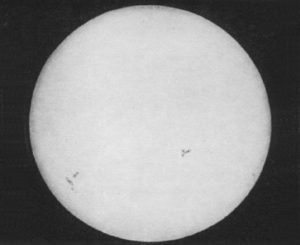 French physicists Louis Fizeau and Leon Foucault took the first successful photograph of the sun using the relatively new daguerreotype photography technology. Their image (shown) captured several groups of sunspots and other interesting details. It showed the sun in a new view which most people had never seen before. Usually, the Sun is too bright to stare at without damaging your eyes, but this photo showed the Sun as something other than a big bright ball of light during the day. 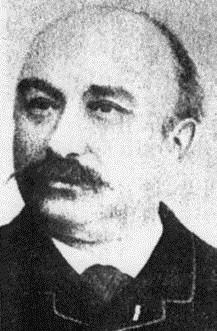 1841 – Clément Ader was born. Ader was a French engineer and inventor who is best known for making the first powered flight in his Éole aircraft – 13 years before the Wright Brothers’ flight. Ader’s aircraft was a bat-winged plane with a steam-powered 20 horsepower engine. His Éole craft flew on October 8, 1890, when it managed to reach an altitude of 20 centimeters under its own power. His aircraft had no directional controls and the steam engine proved to be a dead end as a power plant for aircraft. Ader also improved the design of Alexander Graham Bell’s telephone and established the first telephone exchange in Paris. He invented a device to send stereo sound over telephone lines and transmitted a stereo performance of an opera to another location two miles away. 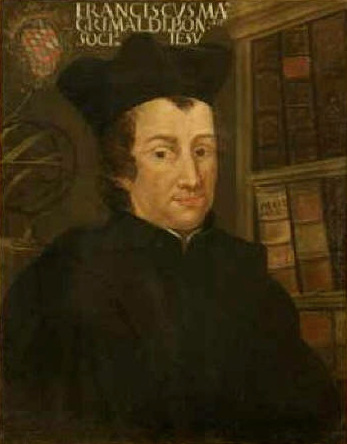 1618 – Francesco Maria Grimaldi was born. Grimaldi was an Italian Jesuit scholar who was the first to note light will spread out when shined through a thin slit and named this effect diffraction. He also investigated the behavior of items in free fall with Giovanni Riccioli and found the distance the falling object fell was proportional to the square of the time it took to fall.